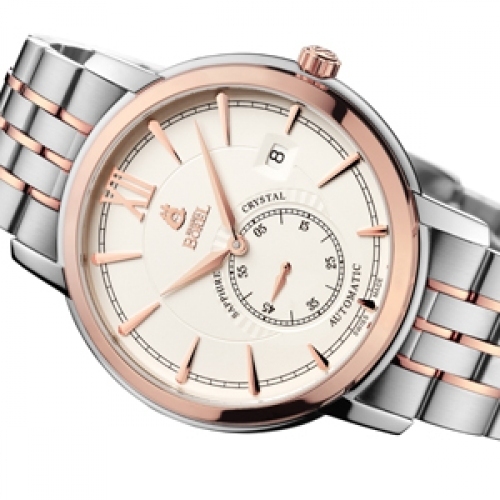 Founded in 1856, the Ernest Borel company celebrated its 155th anniversary in 2011 and took the opportunity to present new models and lay a new milestone in brand history, as epitomised by the Royal Collection. 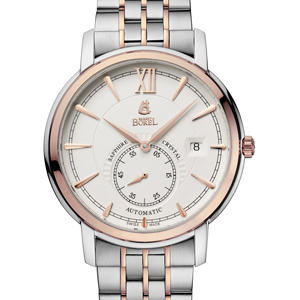 The product line is constantly reworked while preserving the inimitable Ernest Borel spirit and style. While this three-hand plus date model offers a pleasing blend of steel and gold tones clothing a classic round design and an extremely pure dial, it avoids any sense of monotony thanks to its small seconds off-centred at 6 o’clock. The transparent caseback also offers a chance to spend pleasant minutes watching the rhodiumed oscillating weight steadily swaying to and fro. 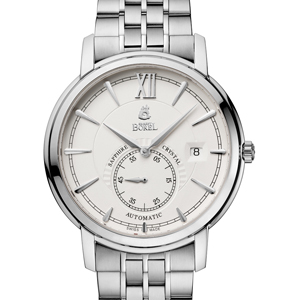 This refined model offers ample proof, if such were needed, that Ernest Borel has lost none of its know-how over the past 155 years.